As a child I can vividly remember my grandmother, as well as my mother making coconut wreaths at Christmas. 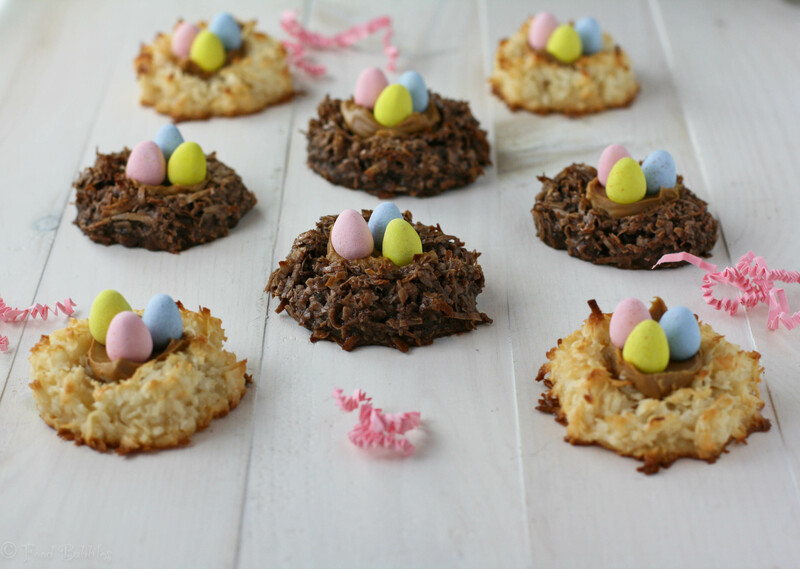 They were coconut macaroons shaped like wreaths and decorated with little cinnamon candies. Such delightful little cookies that bring back such wonderful childhood memories. I adore coconut and recently found myself traveling a long thought process that led me to thinking about those cookies for some reason. So I decided I needed to make coconut macaroons, not to be confused with macarons which are my latest passion and challenge. Macaroons are just about one of the easiest cookies to make. You simply combine the coconut with a mixture of egg whites and sweetened condensed milk and that’s about it. Bake them up and you’ve got a quick, easy cookie with a slightly crisp exterior and a chewy interior that are the perfect contrast. Even better, put a little indent in the center and you’ve got the perfect place to dollop a little something wonderful. In my nests, I decided to put Biscoff spread. I don’t know if you’re familiar with Biscoff cookies but they’re a delightful little European cookies from Belgium and they also make it into a spread that’s very much akin to the consistency of peanut butter. 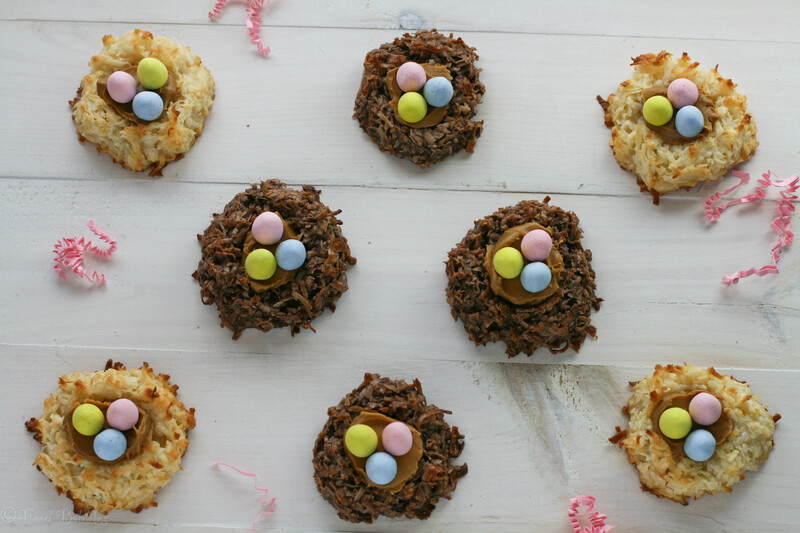 These cute little nests come together in mere minutes and are sure to be devoured. I made some plain and some chocolate too. They’ll make the perfect Easter treat! Of course, if it’s not Easter they’ll make a great treat too all by themselves. – Preheat oven to 325 degrees and line a baking sheet with parchment paper. – In a large bowl combine the egg whites, sweetened condensed milk, almond extract and salt. Fold in the coconut until well combined. – Bake 15-20 minutes until golden brown. Cool on the pan for about 5 minutes before moving them to a cooling rack. Cool completely. 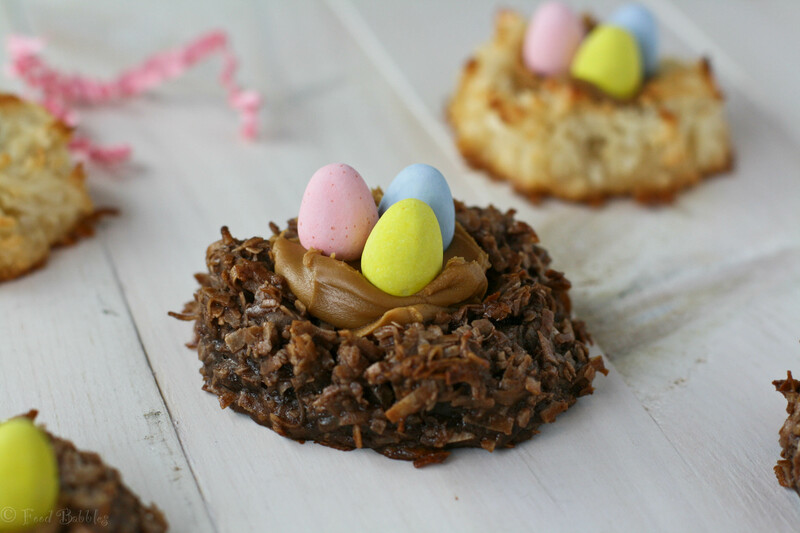 – Fill center with Biscoff spread and top with 2 or 3 eggs. 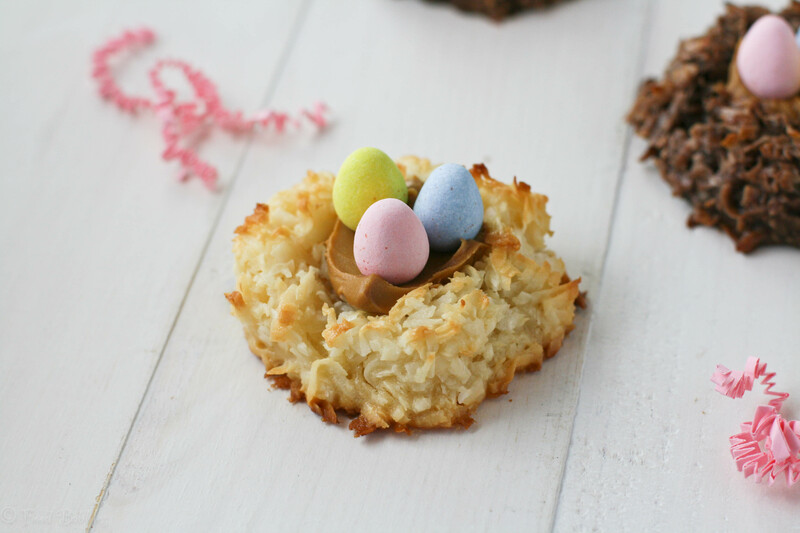 Great idea, love the edible nests. Perfect for Easter. Thanks so much! They were an updated blast from the past, that’s for sure. What a great idea. And I love the addition of biscoff spread. I really need to find a jar of that soon! Thanks! Oh, and Biscoff spread is seriously delicious. Loving it! Wow, these sound absolutely yummy! Any chance we might have some of them tomorrow????? And how yummy they were! Loved the mini quiches and the other treats, sorry I forgot what you called them !! But they were good! These are an Easter tradition in my family! Glad to see them here! So delicious! I love family traditions. It’s always so amazing to me how a certain food can bring you right back to being a kid. Aren’t these such a fun and easy treat? I have such fond memories of my grandmother and mother making little Christmas wreath ones. So tasty! Hope you like them Yvonne! I loved how quick and easy they were to make but also cute and tasty. OMG biscoff. You’re my hero! These are gorgeous! Thanks Chichi! And they’re so easy to make too which is always a plus.